Cinnamon for Health and Taste! As New Year’s resolutions are upon us and many a noble and sincere resolve has been added to our list of soon-to-be-full-fledged lifestyle changes, please allow me to add one dietary measure that has potential of sticking with you after March. Start using Cinnamon in many, if not all, of your dishes – healthy or not! Cinnamon is a sweet, pungent spice that can be used in everything from desserts to main dishes, including meat. Cinnamon is the most consumed spice worldwide and its health benefits are extensive. It is a noted anti-inflammatory and very effective in wound healing, due to its strong antibiotic properties. It can even help prevent tooth decay and bad breath! Cinnamon is a source of cinnamaldehyde, a known colon cancer preventer. 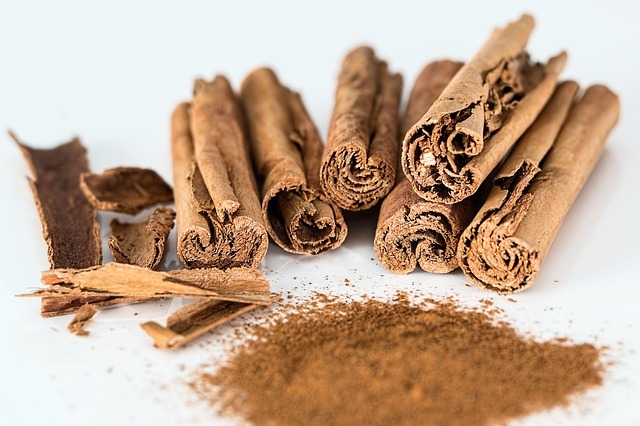 Cinnamon has been shown to improve learning and even help in the treatment of Alzheimer’s disease by reducing plaques in the brain that are known to cause dementia. It helps with weight loss (New Year’s Resolution anyone? ), and helps control blood sugars in insulin resistance and diabetes. Cinnamon also protects against food-borne illness caused by bacteria such as salmonella and listeria. So, this New Year, make some resolutions that will have profound and lasting effects. Add Cinnamon to everything you cook/eat when you can – Happy New Year!